Postcards are an economical way to get your message across with style. Typically thicker than Fliers, Postcards are ideal for promoting art exhibitions, concerts or any event! These unique Postcards allow you enough surface area to promote your cause but are small enough to give out by hand. • Standard turn time is 3-4 business days. "Working with Brian and Mirror Image is a dream. Every time I recommend him, those who work with him come back to thank me--which is always reassuring. They print everything I do, with much success. They are always on time, if not earlier than I ask. The graphic design work that can be done out of his office, always helps the process as well. I know when I send him something if it isn't perfect, they will fix it so that I am happy. I truly recommend Brian and Mirror Image with many high regards." In addition to printing, we also offer direct mailings from supplied mailing list or if you don’t have a list, another great way is EDDM (Every Door Direct Mail) it designed to help businesses deploy promotions and advertisements to a targeted area, this U.S. Postal Service program allows the customer to have their mailer hand delivered to every mailbox along chosen routes. 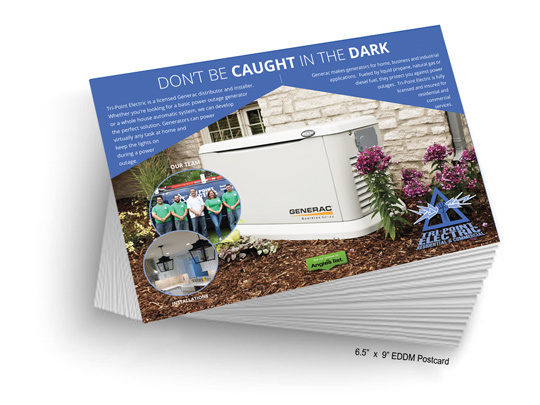 EDDM is a cost effective alternative to traditional direct mail that allows you to saturate the market and promote to every household or business in a desired geography.